Dan Fong, Mandarins' brass caption head, sent this picture. 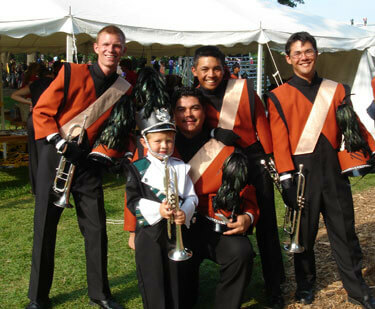 Here is a post-show candid with Mandarins' Jacob, Mario, Santiago and Chris, along with a future Seattle Cascade. No doubt, the young trumpet player will be in the ranks real soon, although he said be wanted to be a drummer!